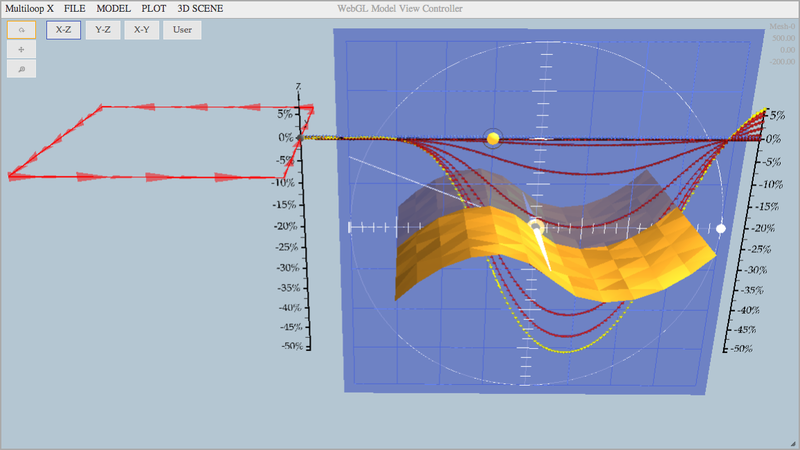 MultiloopGL is the current version in a series of a 3D forward modelling programs built to aid in the understanding and interpretation of electromagnetic responses. This software provides an efficient "forward modelling" workflow by positioning conductive bodies near a transmitting loop, and plotting their model responses. The model data can then be compared to data collected in the field, and in this way conductive bodies are iteratively adjusted. Multiloop has had a long standing history within Lamontagne Geophyscs Ltd - we have been depending on Multiloop to aid in our EM interpretation for over 30 years. Multiloop II is the gold standard (albeit historic) version of this software. Originally released in 1993, it can still be depended on for fast, reliable responses using simple ribbon plates as conductors. Multiloop III is an ambitious reworking of the original concept. Rather than a ribbon plate, this solver is mesh-based, and so if a mesh can be built, Multiloop III can generate a solution. Significantly more powerful, this program is packed with features and is suitable for a diverse number of problems in addition to geophysical applications, such as environmental mapping and electrical engineering. Most recently, Multiloop III has been made into a versatile new engine, MultiloopGL. The engine reads in the parameters of your model in xml or binary format, and writes an ascii response for plotting. As such, MultiloopGL can run on multiple platforms and read in survey data from any third party and aid in building and solving EM friendly meshes.